NOTE: As both a naturopathic doctor and human being, I find the subject of human relationships both fascinating and relevant to our physical health. The emotional pain around romantic difficulties can actually cause physical declines in our health and around our self-care. There are already many good books written on human relationships and many more that probably still need to be written (I highly recommend a book called “Attached“, by Dr. Amir Levine & Rachel Heller). Given that so much has already been said and there is still so much left to say, there is no way that this article can do the subject justice. Nonetheless, I thought it might be worthwhile to share a few brief thoughts about one aspect of human relationships: the feeling (or fear) of settling in a relationship. This article is opinion and comes from one point of view at one time and it may not be relevant or meaningful to you and that is okay. Also, the only action advocated here is self-awareness. In places where I may realize that there’s an unhealthy pattern, I have the power to modify my decisions and better define my own personal boundaries. Anyway, let’s talk about “settling” as it pertains to a romantic relationship. In the naturopathic medical community many people talk about doing the work, but maybe it’s worth sharing a few insights into what doing that work might look like for me. My goal is to raise my self-awareness so that I am making decisions that align with my values and that will lead me toward increasing joy and fulfillment while learning what I can from painful life lessons so I don’t have to repeat them. Definitions of “settling” in a relationship certainly vary, but most definitions describe feeling that one party does not measure up to another person’s standard. The problem is, that no two people will ever be perfectly matched in all attributes at all times. The value placed on different personal traits is subjective (and subject to change). Social scientists have pointed out that the standard of what defines a “good marriage” has risen dramatically over the years. Bygone generations felt that a good marriage was one where you could rely on the person to meet certain basic day-to-day needs like earning a paycheck, doing chores or raising children. Today, we expect our partner to be intimately involved in virtually every area of our life while also be our emotional confidant, soul-mate as well as our passionate lover. With this in mind, the feeling of having settled might be taken with a proverbial grain of salt because today’s standards for what a relationship is supposed be are much higher. In this brave new world that is 21st century coupling, we don’t always know what is (im)possible. Some people who leave a relationship may find that the grass was not greener and have no way of going back while others may leave and then wonder what held them back for so long. No matter what the outcome of a relationship decision, a wise goal is to learn from our decisions/outcomes so we can increase joy and fulfillment while minimizing repeating the same painful mistakes. Painful mistakes in life are inevitable. Unfortunately, our natural tendency is that we want to get away from the pain as soon as possible, often without really learning the lesson from that pain. I believe that taking some time to feel the pain and learn the lesson it has to teach us can help us see what our patterns are so that we can avoid having to re-learn the same painful mistakes over and over again. Self-awareness in our relationship decisions leading to more joy and fulfillment sounds great… so, why don’t more people do it? The answer is that often self-awareness comes through things that don’t come naturally to humans. For me, self-awareness entails slowing down and meditating when I feel like keeping myself too busy to notice how sad/hurt I might be. Self-awareness involves being uncomfortable and asking ourselves tough questions while taking responsibility for our lives and (in)actions. If I felt like I was settling in a relationship, I can ask myself how/why I got to that place rather than focusing on what my partner might lack. Almost anywhere in a relationship where I could unproductively blame my partner could also cue me toward positive introspection. At times of painful breakups, I have made positive changes by asking myself tough questions, and answering them honestly. Below are a few hypothetical answers for why I may have had negative outcomes in past relationships. Why might I be attracted to “settling” for negative personal traits? Maybe I pursue emotionally unavailable/unhealthy partners to prove my worth to myself or others. Maybe I attract overly needy partners so I never have to express my own need for connection. Maybe an overly passive partner won’t question my insecure need to dominate. Maybe an irresponsible partner lets me have more control/safety in the relationship. Maybe a controlling partner gives me an excuse to not take ownership for my life choices. Maybe a partner with an addiction will overlook my own unhealthy patterns. Maybe a less successful partner gives me more control over financial decisions. Maybe my choice of partners is more about pleasing my friends/family/society than me choosing what I want. Maybe my choice of a partner is a reaction to unhealthy patterns that I experienced growing up. Maybe I’m not settling at all and I need to filter out people’s/society’s opinions when they don’t align with my own values. I could go on, but all of these possible underlying reasons have a side-effect that may be perceived as beneficial to me in some way. In each hypothetical scenario above, it would be easy for me to believe that the partner was “the one with the problem” and while that may well be true, it wouldn’t be the whole truth. I could go through life as a victim of “randomly” bad romantic partner(s) without ever questioning my own role in my “bad luck”. In this way, bad luck in relationships may be akin to psychological projection. None of the above examples ever excuse abusive behavior. In cases of abuse, seek professional help from a counselor experienced in your situation. If you feel unsafe, call the police. In an abusive situation, your responsibility is to accept that abuse is never acceptable and get out. For more information on abuse, this article may be helpful. 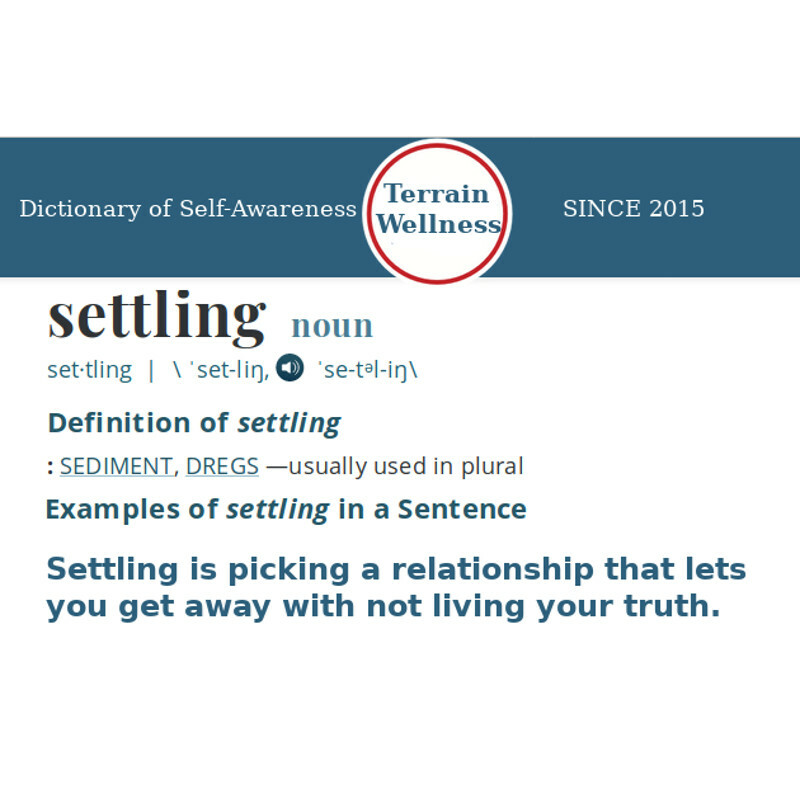 What is Settling in a Relationship? So, what is settling at its core? For me, I feel that settling would be picking a relationship that lets me get away with not living my truth. If I was truly dissatisfied with my partner, I would have to ask why I chose that for myself. I believe that the more self-aware we can become about our relationship decisions, the better we can make conscious decisions toward more joy and fulfillment. For me, part of self-awareness is taking ownership of my role in choosing a relationship and taking the time to ask myself why I do what I do. Relationships are difficult and we’re all in this together.